A wonderfully funny whirlwind adventure, full of madcap mishaps and misunderstandings, as Mary Plain goes on her first ever `svisit' and ends up as Berne's most famous bear! Join Mary, who in her own words is 'an unusual first-class bear', as she tries all sorts of new things, including eclairs, cream buns, going on buses, aeroplanes, boats, taxis and even winning first prize at a show, all in the company of her long suffering-friend, the Owl Man. 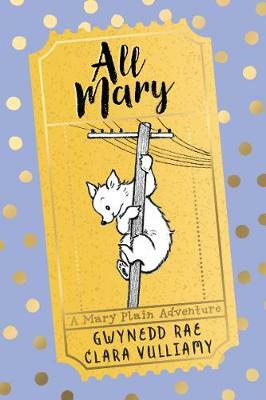 Gwynedd Rae's enchanting Mary Plain stories have an enduring, timeless appeal and Clara Vulliamy's fresh, funny and energetic illustrations will introduce Mary Plain and friends to a whole new generation of readers. The original text is lovingly reproduced in this hardback foiled edition, with brand-new black and white artwork by renowned illustrator Clara Vulliamy, including a new heart-warming introduction from Clara Vulliamy about what the books mean to her. `Clara Vulliamy's joyous fuzzy-furred pictures are a perfect match for these down-to-earth tales' - The Guardian Welsh author Gwynedd Rae (1892-1977) was the creator of the much-loved Mary Plain series. The first book in the series, Mostly Mary,was published in 1930 and the last, Mary Plain's Whodunnit, was published in 1965. The series includes 14 books about Mary's adventures. They became hugely popular when they were read on BBC Radio Children's Hour during the 1930s. Clara Vulliamy has illustrated over 35 children's books and has been published by HarperCollins, Orchard Books, Random House, Walker Books and Kingfisher. She studied at Chelsea School of Art and The Royal Academy, beginning her working life as a portrait painter and illustrator for newspapers and magazines. She is the daughter of celebrated author and illustrator, Shirley Hughes, and together they created the Dixie O'Day series. She lives in Twickenham with her husband and their two grown-up daughters.